Have a cool gift for Dad yet? Father’s Day is just around the corner on June 17th. Our 2018 gift guide features 15 unique and personalized gift ideas that Dad will love. We also haven’t forgotten about the husbands and grandfathers. Creative gift options are available to thank all of the special men in your life who have left a lasting impression. There’s something for every type of guy: travelers, sports fanatics, office moguls, masters of the man cave and beyond. We hope you like what you see. Happy Father’s Day! Buy Now $37.95. 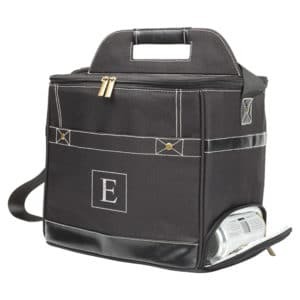 This unique cooler is perfect for an afternoon at the park or lake. The cooler actually does the work for you. Just load it up with 16oz. cans and watch the magic happen. The bottom zipper opens up and the cans dispense smoothly on their own. Bottoms up! Buy Now $39.95. Dad has always shown you the correct path. Return the favor with a thoughtful gift that he’ll love for years to come. This compass can be engraved with dad’s name or initials. The wooden gift box is included for no extra cost. Buy Now $19.95. Does Dad enjoy starting each day with a piping hot cup of joe? If so, this is the perfect coffee mug for him. The mug features the bear silhouette and the words “Papa Bear.” We’ll add his name below the bear for no extra cost. It also makes a super fun gift for the guy who’s about to find out he’s becoming a father. Buy Now $26.95. Don’t make Dad use his beat up old bottle opener any longer. 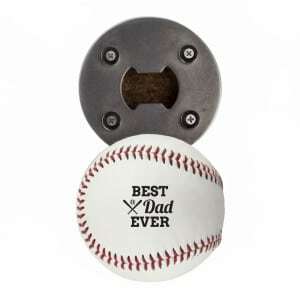 This creative bottle opener is made from a real baseball and will stick to your refrigerator thanks to the magnetic backing. There are six personalization designs to choose from. Find the one that’s perfect for your old man! Buy Now $77.95. Nothing ruins a business trip quicker than a wrinkled suit. 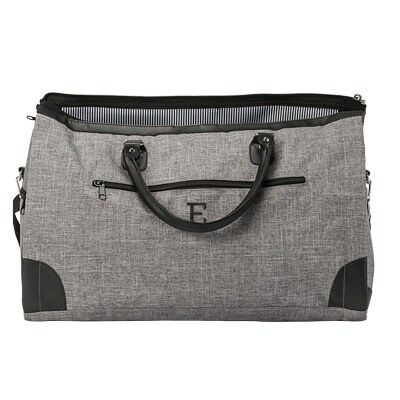 This polyester and vegan leather grey hanging garment bag solves that problem with a stylish touch. It unzips to reveal a spacious interior that will hold several suits, shirts, shoes and accessories. Don’t let Dad hit the road with out it! Buy Now $39.95. Make sure your favorite bearded man is set up for travel success with a customized dopp kitt that includes a set of beard grooming essentials. The included brush, comb and trimming scissors fit easily inside the spacious waxed canvas kit. A true best seller that Dad will cherish and actually get quality use out of. Buy Now $38.95. Is Dad tired of lugging his beer around in a boring old cooler? We’ve got the answer to his troubles. Our waxed canvas totes comfortably transport beers to destinations both near and far. Available in blue and green — they will comfortably hold six beers. Each beer fits into its own divided section. The best part? We’ll engrave Dad’s initials for no extra charge. Buy Now $68.95. Complete the look of his office, den or man cave with an authentic Louisville Slugger baseball bat. 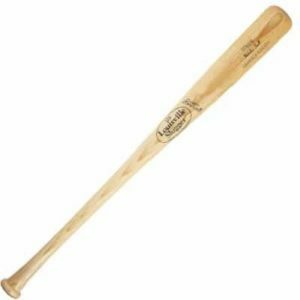 This 34″ bat is the same size uses by pros like Mike Trout, Bryce Harper and Kris Bryant. The barrel of the bat may be engraved with a special message to Dad — at no additional cost. The bat can also be purchased with the logo of his favorite MLB team engraved. Score! Buy Now $39.95. Nothing beat a good mixture of music and technology. Insert a phone into the slot, turn on your favorite song and let the Edison Amp do the rest. The copper bell will amplify the sound – giving an old fashioned feel to both old and new music. This gift makes a great conversation piece for the coffee table or kitchen counter. Buy Now $57.95. Instead of giving him a watch (which he already has 10 of), give him a special place to store these cherished time pieces. This leatherette box holds up to six watches and includes the cushions that they will safely rest on. A truly classic gift for a classic guy. Buy Now $44.95. You may think that Dad already has all of the golf accessories he’ll ever need Wrong! With the Hampton Putter Set, he can keep his putting skills in top shape from the comfort of his office or basement. The wood case contains one right handed putter, two golf balls and a golf hole. Buy Now $44.95. 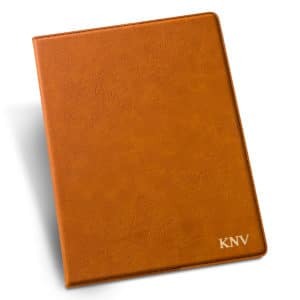 This stylish portfolio is available in rawhide, brown, mocha and black colors. The interior features a lined notepad so he can keep notes during all of his important meetings. Add a touch of personality to the gift by customizing with Dad’s initials. Buy Now $57.95. Our waxed canvas messenger bags are cooler, more stylish and cheaper than a formal briefcase. Dad will love the large interior that comfortably holds a laptop, textbooks, tablet and more. Available in blue and green with free personalization available. Buy Now $37.95. Dad’s earned the right to never have to bend over and pick up his own bottle cap. With this unique cap catching bottle opener, he won’t have to! The piece is crafted from acacia wood and slate. The bottom portion has a built in magnet that catches the caps before they fall to the ground. We include the mounting materials needed to attach it to the wall. 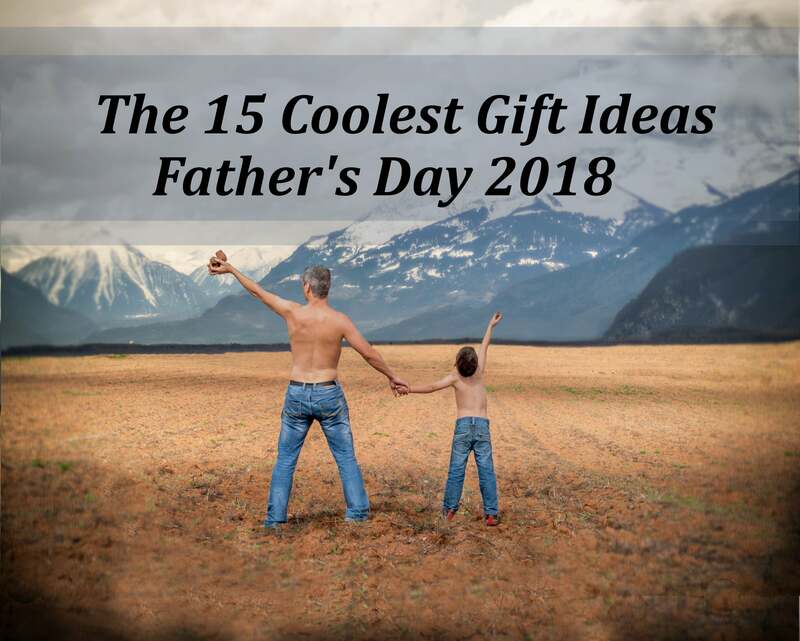 We even bet Dad will offer you a free cold one for giving him such a cool gift. Buy Now $37.95. This is the ultimate pocket multi-tool for knocking out those odd jobs around the house. It includes a hammer, wire cutters, pliers, flat head screwdriver, bottle opener, saw blade, Phillips head screwdriver, nail file, and knife blade. We’ll engrave Dad’s initials on the wood surface for no extra fee! What’s the best gift you’ve ever given Dad? The worst? Let us know in the comment section below!